Beat the egg whites with the salt until stiff. Add half the sugar and continue beating until the mixture turns glossy. Add the remaining sugar and vinegar, continue to beat until the mixture is fine-textured, glossy and very stiff. Spread the mixture on a baking tray lined with baking paper (approx. 20 cm diameter), form peaks with a fork. Bake/dry for approx. 20 mins. in the lower half of an oven preheated to 150°C. Turn the oven down to 120°C and allow the pavlova to dry for about 1 hour 40 mins. Then switch the oven off and leave the pavlova to cool in the oven with the door open. Slice off the top and bottom of the oranges, then peel all round the fruit down to the flesh. Using a sharp knife, cut out the segments between the white membranes. Place the chocolate and butter in a thin-sided bowl and suspend over the gently simmering bain-marie; the bowl must not touch the water. Melt the chocolate and stir until smooth. 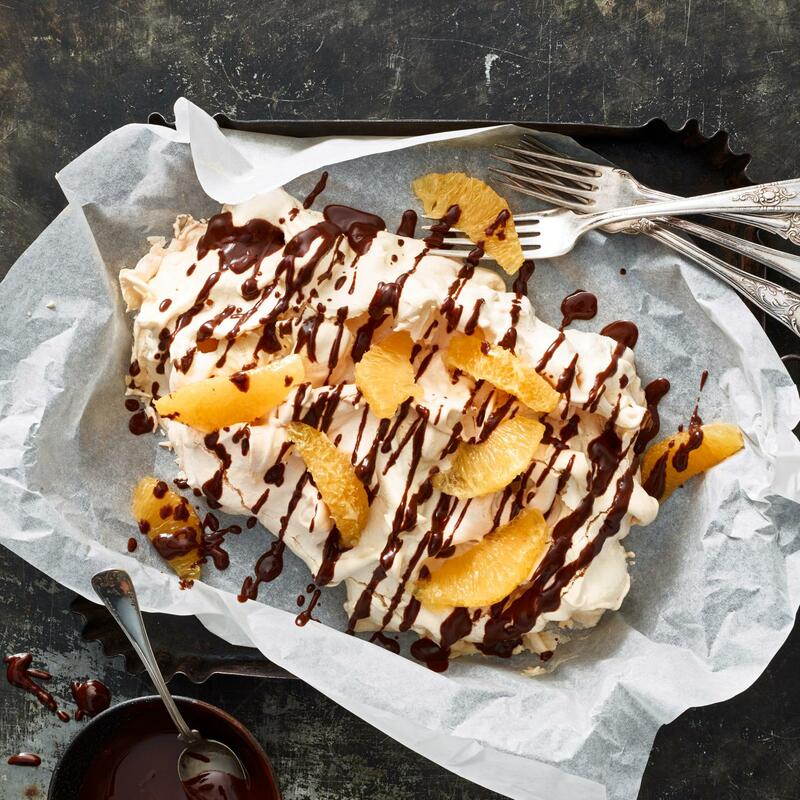 Divide the chocolate over the pavlova and arrange the orange slices on top.